This Spring Performance Space presents 1 House = 1000 Homes a new art and architecture project that proposes the speculative financial redistribution of an Australian home. Led by artist and undergraduate architect Mathieu Gallois and graduate architects Caz Comino and Vesna Trobec this concept-driven exhibition will inhabit the expansive foyer space of Sydney’s iconic CarriageWorks from 23 October –14 November. “1 House = 1000 Homes contrasts the exponential growth of Australia’s metropolitan property market over the last 20 years against a continued need for basic shelter and amenities in some of the world’s poorest countries”. On 29 September 2009, tropical storm Ketsana ravaged Manila killing over 250 people. The women-led Technical Assistance Organisation (TAO), represented in the 1 House = 1000 Homes exhibition has been fighting to secure tenure and safe-housing for residents of flood-stricken, slum areas of Manila since 1992. 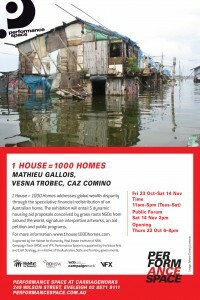 1 House = 1000 Homes brings the work of TAO and six other international non-government organisations that are running community-based housing projects to Sydney audiences. These seven community organisations – from Ghana, Philippines, Peru, Papua New Guinea, Thailand, Namibia and Sri Lanka – have been invited to submit a proposal addressing how they could utilise the money from the sale of a single Australian home or homes within their communities. For the exhibition at Performance Space Gallois, Comino and Trobec are showing the seven international proposals in an installation that will include large-scale sculpture, photographs, banners, painting, video and animation. The exhibition marks the beginning of a fundraising drive by Gallois, Comino and Trobec who are working with not-for-profit global organisation Habitat For Humanity towards the project’s ultimate goal of securing AUD $1,000,000. Project Supported by: Habitat For Humanity, The Visual Arts Board of the Australia Council, Real Estate Institute for NSW, WDA Campaign Track and VFX. The Visual Arts program of Performance Space is supported by the Visual Arts and Craft Strategy, an initiative of the Australian State and Territory Governments, The Australian Government through the Australia Council, its arts funding and advisory body and the NSW Government through Arts NSW. This entry was posted in Press Release and tagged exhibit, Habitat for Humanity, Homes, House, hse, Tao Pilipinas, urban poor communities. Bookmark the permalink. I want to thank the blogger very much not only for this post but also for his all previous efforts. I found hse.tao-pilipinas.org to be extremely interesting. I will be coming back to hse.tao-pilipinas.org for more information. Where abouts are you from? can’t tell from your use of english if its UK English or American English! Great Post. I would love to read more in future. keep up the good work. Your website is gaining more popularity thanks to portals like Myspace and additional social sites. Thanks again for the interesting post I’ll be back for updates.